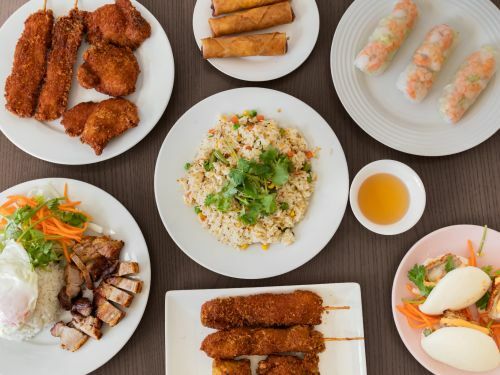 Menulog delivers for Khoai Fast Foods so you'll be able to track your courier on a map. Fried onion, garlic butter, pickled carrot, lettuce, cucumber, coriander, chilli, soy sauce and pepper. Spring Roll, Vermicelli Rice noodles, lettuce, cucumber, mint, tomato, pickled carrot, vinegar sauce, coriander and peanuts. Spring roll or chicken wing, cans coke or lipton and combination roll extra. Noodle salad and cans coke or lipton. Salad and cans coke or lipton. Serves four (lemongrass chicken and roasted pork). Vermicelli rice noodles, lettuce, cucumber, mint, carrot, Hoisin sauce and peanuts. Cucumber, lettuce, tomato, coriander, fish sauce, pickled carrot and fried egg. $4.50 each or 3 for $12.00. Cucumber, chilli mayo and mint. Strawberry or mango with full cream milk and ice cream.